More and more businesses are realising how effective and cheap it is to use vinyl wraps on their company vehicles to advertise themselves. Using a wrap can be as much as three times cheaper than a respray or a paint job and it’s 100% reversible! You might not need to be convinced about the impact and effectiveness of car wraps when it comes to getting your message and details out there, but you may be wondering whether you should opt for a half or a full car treatment. This doesn’t actually answer the question, even though it’s good news! Basically, a lot of your decision will be led by your budget as although a full car wrap is cheaper than a respray, a half car wrap is cheaper still. 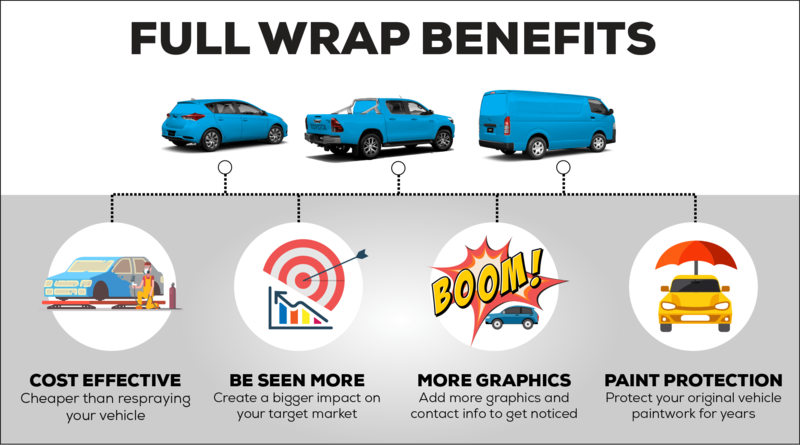 If you go for a full car wrap then you can make a bigger impact on your target market. Not only can you incorporate your amazing and humorous dog-walking service logo but you can add enough text and contact details to really get the job done. You’ll also be protecting the original paintwork of your vehicle so that when you decide to sell it on the new owner will be grateful to the tune of a few hundred extra dollars! On the other hand, a half car wrap can be just as effective, depending on your business. If you’re in a more serious sector than dog-walking – you may be a tax lawyer or a funeral director – then you’ll want your wrap to be somewhat more sober and less in-your-face. You’ll need to show your details and the fact you exist, obviously, but a funny image probably isn’t appropriate. 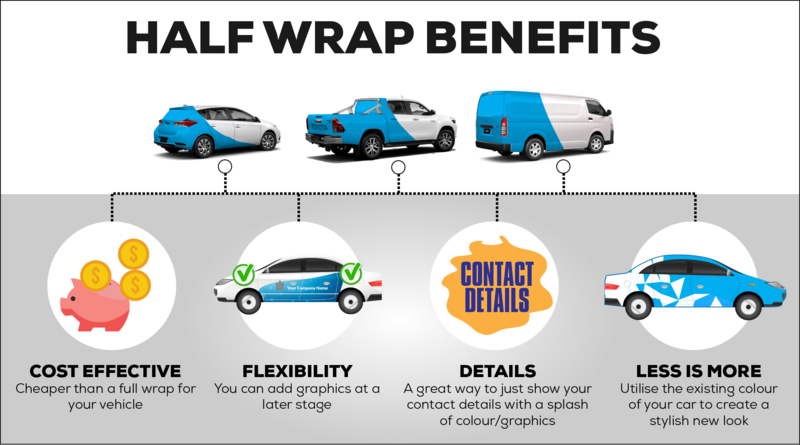 The obvious advantage to a half car wrap is the cost, of course, but you’ll also have more flexibility if you want to change up your look a bit. If you want to add some extra details or a new image, then you’ll have the space on the chassis to do just that without having to remove the older wrap and start all over again.